Cantieri di Pisa (Pisa Boatyard) are this year presenting the new Akhir 110, "Dora G", a boat that will be displayed at the Genoa Boat Show. It's a fly motoryacht, with overall length 33.10 m. by 7.45 width, quite classic in its shape but nevertheless faithful to the style of the Tuscany boatyard. On the lower deck there are three cabins for the crew at the bow, a VIP stateroom, two guest staterooms with twin beds and the boat owner's stateroom that utilises the entire beam of the hull. Astern there is the engine room and the garage for the tender. On the "main deck" there is a large living room with a dining area from which access is gained to the lobby where there are the stairs that lead to the deck below and the raised bridge. At the bow there is a study, which if necessary can be transformed into a fifth guest stateroom, then there is the galley, with access to the crew area. 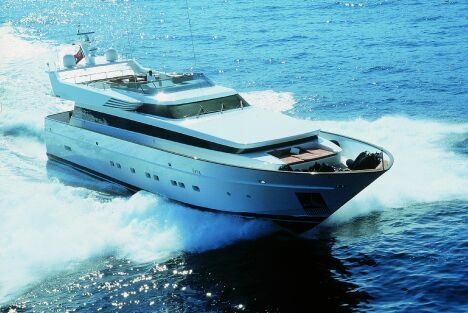 Motorised with 2x2,285 HP MTÙs, "Dora G" reaches a maximum speed of 27 knots, with a range of 650 miles.